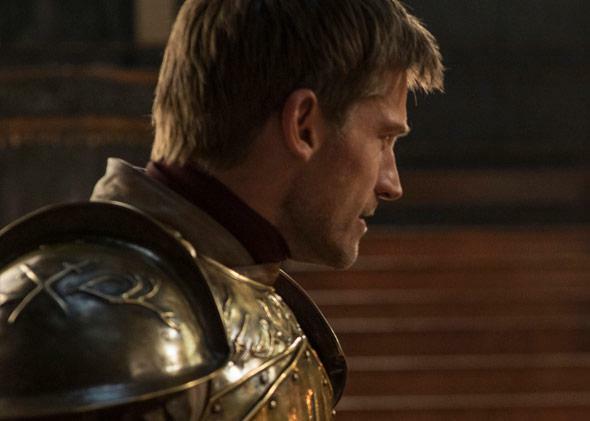 Game of Thrones: Who would win in a fight between Jaime Lannister and Khal Drogo? Who Would Win in a Fight Between Jaime Lannister and Khal Drogo? Nikolaj Coster-Waldau as Jaime Lannister on Game of Thrones. In Game of Thrones, Westerosi knights wear full-plate armor, often carry shields, and use heavy piercing weapons designed to defeat said armor. Their equipment and fighting style are geared around frontal assaults. The Dothraki disdain armor and shields, and their light slashing weapons are ineffective against armor. Their equipment and fighting style are based on hit-and-run tactics. The holy grail of all warfare is to be able to hurt your opponent while simultaneously denying your opponent the ability to hurt you. If you are able to do this, you will win—you’re shooting fish in a barrel. In single combat, mobility, the Dothraki’s only advantage, is nullified. The Dothraki can’t hurt the knight—an arakh can only slash, and plate armor is a near-perfect defense against slashing attacks. A cruciform arming sword can slash or stab, and either one works just fine against bare flesh. Even without armor, in a one-on-one fight, a man with a sword and shield has a nearly unbeatable advantage over a man armed with just a sword: He can attack and defend simultaneously, whereas his opponent can only do one or the other. The only thing that can counter that advantage is if the single-weapon fighter has something that gives him a longer reach: a polearm or a greatsword. With a reach advantage, the single-weapon fighter can attack while potentially staying out of range of a counterattack. The sword-and-board man still has the advantage, though, because he is better defended and burns less energy—he is mostly static except for short sprints, while the spearman is forced to be constantly mobile. In a three-on-three fight (three spearmen versus three sword-and-shield fighters), the spearmen have the advantage, because two of the spearmen can control range while one attacks without fear of counterattack. The swordsmen have to stay together and form a shieldwall if they don’t want to be picked off one at a time, which limits their mobility. They have to charge as a group if they want to get inside the range of the spears, which is risky. As an army, the Dothraki are dangerous because of their bows and superior mobility. When the Mongols fought European knights, they’d have one-third of their force ride into range, loose a volley of arrows, then retreat. The other two-thirds would be in the distance, forming the jaws of a pincer. If the knights chased the retreating Mongols, they’d get caught in the pincer trap and be surrounded. If they didn’t pursue they would take casualties without inflicting any in return—an arrow wound doesn’t have to be fatal to take a knight out of the fight. One-on-one, the Mongols were weaker, but they used their superior mobility and striking range to force a fight on terms that were favorable to them. Hypothetical Battles of Westeros: Who’d win in a fight: Theon Greyjoy (pre-torture) or Ramsay Bolton? Game of Thrones: What evidence is there that Jon Snow is not Ned Stark’s son? Hypothetical Battles: Who would win a fight between Mongols led by Genghis Khan and Spartans led by Leonidas?